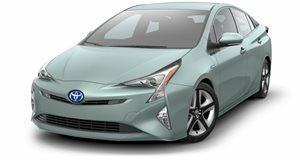 The 2011 Toyota Prius will be receiving a Plus Performance Package that will give the hybrid some additional in-house features. The package first dubuted at the 2010 SEMA Auto Show in Las Vegas, Nevada. And the actual retail price of the 2011 Toyota Prius Plus Performance Package (try saying that fast three times) will begin at an additional $3,699 over the base price for the Prius Two, Three, and Four models and $2,999 for the Prius Five when it goes on sale this month. The package includes such features as a seven-piece aerodynamic ground effects kit and 17-inch forged alloy wheels. The package is comprised of front and rear lower spoilers, side skirts and rear diffuser giving it a more aggressive look. The Prius Plus Performance Package will also feature Plus logo carpet floor mats. A rear sway bar, constructed of high carbon spring steel to prevent corrosion and road damage, helps reduce body lean as well. This treatment obviously does not turn the Prius into a performance machine. The Prius Plus package was previewed at the 2010 SEMA Auto Show and incorporates components of the new Plus hybrid performance line from Toyota Racing Development. The package will be offered in four exterior colors: Classic Silver Metallic, Black Metallic, Winter Gray Metallic and Blizzard Pearl. As expected, the package will be available in limited quantities.